Home sewing is a very rewarding creative outlet. After the initial investment in a good quality sewing machine, sewing at home can be a great money saver. There is a sense of accomplishment that comes from making something with your own hands, and since your hand-sewn creations are generally very useful, there's a double sense of accomplishment. 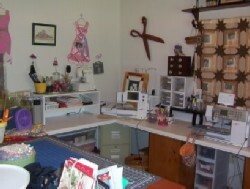 The initial investment in home sewing doesn't need to be huge. You will definitely need a good quality machine, but you have options. You can find a second-hand machine that works great for very little money. I found a Brother machine at a yard sale for $3.00. Take a look at local, online "for sale" sites like Kijiji and Craigslist for sewing machines at great prices. Another option is to buy an inexpensive brand name machine at a store such as K Mart or Wal Mart. Truth be told, you may outgrow your inexpensive machine, but when you're a beginner sewer, there's no need to go with a top of the line machine. When home sewing becomes a passion, or you become frustrated with trying to sew through four layers of denim, (not many home machines can do this) then you will know it's time to upgrade your machine. You can either draw the barbie dolls clothes patterns out yourself or purchase the ebook and have them ready to print and use. Either way this is a great collection of Mix n Match Barbie Doll Wardrobe, you don't want to miss this set.